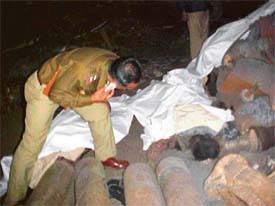 Three labourers were killed and two others were seriously injured in a mysterious blast at Mukesh Steels Ltd at Giaspura late this evening, raising fear of scrap bombs again finding their way in scrap moulded in such factories. 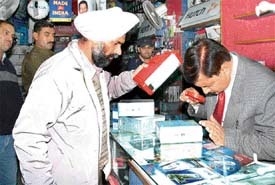 The Ludhiana Vigilance Bureau has unearthed a scandal in the sale, purchase and repair work of electronic equipment and furniture of Braille Press at Jamalpur here. The Unemployed Elementary Teachers Union, Punjab, the Nav Niyukt Employed Teachers Union, the Unemployed Teachers Union and the DSWA held a massive rally here today in protest against the alleged failure of Chief Minister Capt Amarinder Singh to keep his promise made in October that 6,000 vacant posts of elementary teachers would be filled soon. 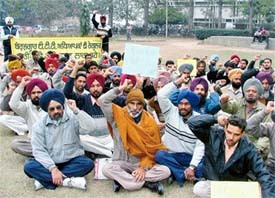 Teachers stage a dharna outside the Deputy Commissioner’s office in Ludhiana on Thursday. In the wake of tsunami disaster, the executive of the local Sutlej Club has cancelled the New Year celebrations function to be held on December 31 in the club. A fire broke out in a hosiery shop in Kutcha No. 7, Field Gunj, today morning and reduced to ashes readymade garments and rolls of cloth. 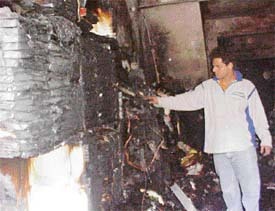 The incident took place in Raman Brother’s hosiery shop around 5 am and it took over four hours for the firemen to douse the flames. The fire engines took a lot of time to reach the spot as the approach streets were quite narrow. To protest against the passing of a proposal regarding amendments to town planning rules to allegedly ‘benefit an influential industrialist’, the opposition in the municipal corporation will take up the matter with the Secretary, Local Bodies. Mr Malkiat Singh Dakha, MLA and former state minister, has asserted that the pace of development of the Dakha constituency has been accelerated and work on various development projects has been accelerated and funds amounting to around Rs 7 crores are being spent on these. Factionalism among councillors marred the development of the local town this year and despite efforts by mediators, the civic body chief could not win the confidence of 10 councillors, who had showed their resentment by moving a no-confidence motion against him six months ago. The Department of Central Excise today began a two-day service tax registration camp for transporters in the city. Even as the process of spot registration continued till evening, around 120 units had got themselves registered. The 10-day NSS camp underway in SCD Government College saw an extension lecture on ‘Female Foeticide’ delivered by Dr Kuldeep Kar Sahni, DIO Ludhiana, from CMO office today. With the unanimous re-election of Mr Pardeep Mittal as president of the Akhil Bharatiya Aggarwal Sammelan and seven other office-bearers, the elections of the body, scheduled to be held on January 9 had been rendered unnecessary. Resentment prevails among residents of Rajguru Nagar against the PSEB authorities over alleged biased treatment being meted out to them in the matter of supply of power. Ludhiana may be regarded as one of the most crime-prone areas in the region, but the figures for the passing year suggest otherwise. The official figures indicate that there was a huge decrease in all kind of crime in the city in the past 12 months. The Sunder Nagar police post officials caught an alleged notorious smuggler bringing 60 bottles of liquor in a Palio car here today. 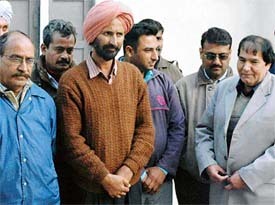 Sources said the police had specific information about the movement of the alleged smuggler, Harmel Singh. A number of checkpoints were set up at strategic places. Two unidentified burglars struck at a mobile phone shop near Ghumar Mandi Chowk in the early morning today and decamped with phones worth several lakhs. The burglars, who had come in a car, used a novel method to avoid being noticed. A 10-day NSS camp of volunteers of Guru Har Krishan Girls College, Phallewal, concluded at Nathumajra village yesterday. The concluding function was presided over by Mr Amarjit Singh Parag; director of the college Mr Labh Singh Ahluwalia, chairman, was the chief guest. 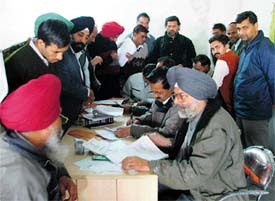 More than 1,000 persons were examined at a two-day medical camp organised by International Sikh Dharam Parchar Manch at Gurdwara Alamgir here. The camp concluded today. Those diagnosed with various diseases were also provided with free medicines. Participants and officials of the ongoing 55th Dhanoa Senior National Basketball Championship are bowled over by the sports infrastructure in the city as well as the hospitality of the Ludhianvis. They are particularly impressed by the organisers of this meet for holding the nationals in a systematic way.